The Advance Step is a dedicated podiatry X-ray system which provides superior imaging performance for podiatry radiology. Fully weight balanced and capable of 90 degrees of angular movement and 8" of linear front to back movement, the Advance Step orthoposer is easy to position for any foot or ankle shot. 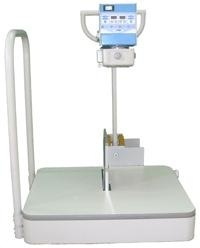 The powerful Advance Step x-ray generator can easily image even the largest patient and is designed for use with high detail 200 speed cassettes and film. The Advance Step generator can be plugged into any 110V outlet and does not require a dedicated line. The platform includes a removable cassette holder for 10"x12" and 8"x10" cassettes. Cassette holders for oversized CR cassettes are available on request.